A moment to sew and to post about it. I'm hoping once we get into our school routine next week, I'll be back to more frequent blogging. I have been sewing, just not nearly as much. We have been pretty busy packing the end of summer full of fun things. Last night I told my husband I just had to sew for a little before we hung out. Remember Farmer's Wife Quilt-along. I looked at my last post about it and had to laugh at my prediction that I would be finished with all the blocks in "early summer." Perhaps I should have specified 2013, because I haven't made one block all summer! The one above is  W.C.T.U. If anyone knows what that stands for, please enlighten me. 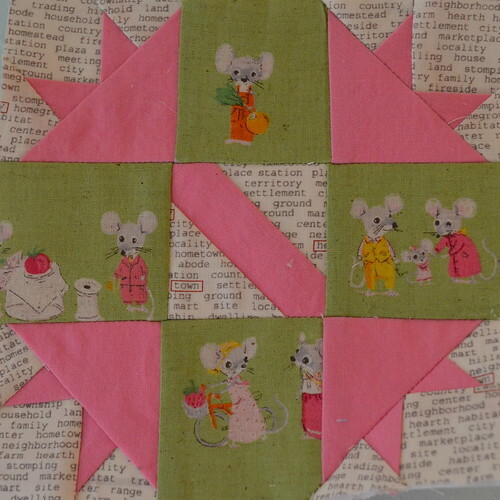 I made it with Nursery Versery mice by Heather Ross, Kona solid - maybe peony?, and Sweetwater's hometown. Periwinkle made good use of my dwindling scraps from Lizzy House's Red Letter Day line. Okay, so what has kept me so busy? 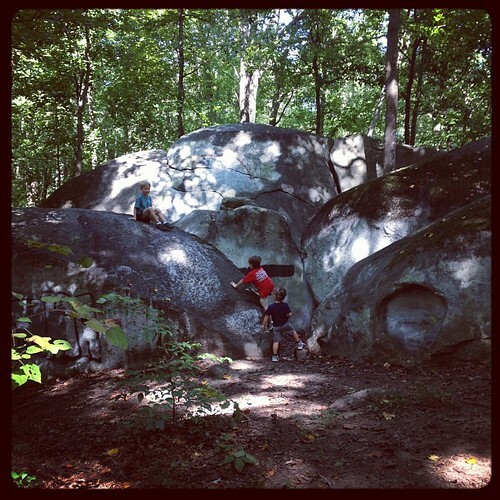 A little impromptu trip to Big Rock Park. Are other people able to take their boy(s) near creeks and keep their shoes dry? Impossible here. 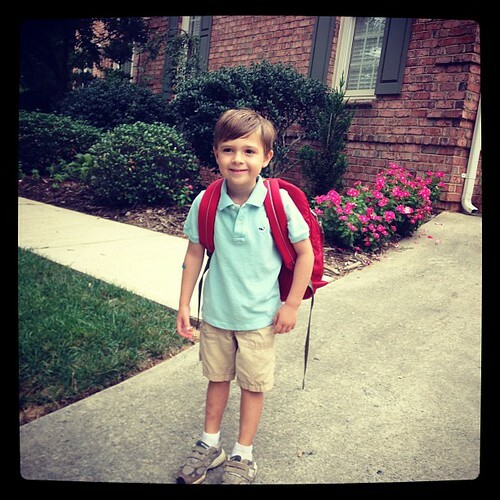 And Jack's first day of kindergarten on Tuesday. They do staggered start here by last name, so he doesn't go back until Friday. So far, so good. He cracks me up. While we were eating breakfast he said, "so I just walk down the street to the next cul-de-sac and when the bus stops I get on?" Aghast, I replied, "We're walking you to the bus stop!" "Oh, good - that's good." He loved riding the bus. He actually knows quite a few kids that ride on it, about 3 more from our 4 house cul-de-sac. And I think he was relieved to hear we would be accompanying him to the bus stop every morning and would be there when he gets off in the afternoon too. Andrew followed him in the car to make sure he got there, but by the time he checked in at the office Jack was already in his classroom and too busy to want his dad around. I think my most exciting sewing related news of the week was the arrival of Heather Ross' new book, PRINTS. Oh my gosh, go buy this book. I knew it was going to have some of her prints to download and cool projects, but gosh it is just amazing. There's a whole section on making repeating patterns on photoshop, with step by step directions/pictures. The book noted you could upload her files to spoonflower or visit her new page there where they would all be. Well I guess pre-ordering the book, they weren't there yet so I uploaded away. I kept checking the directions in her book, it seemed to good to be true, but it definitely said to upload the files. The nice thing about that was I could play with scale, which I do not believe you can do with the ones that are now on her page. 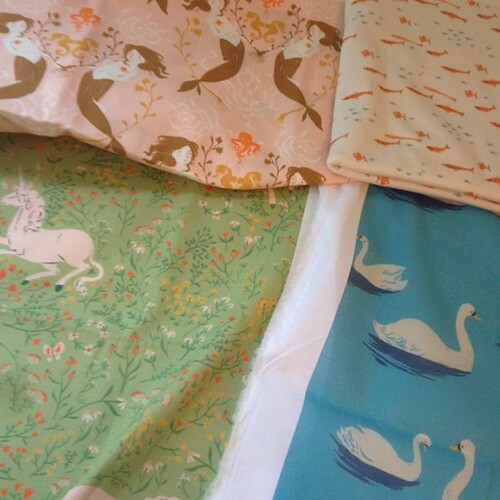 In any case, I got unicorns and mermaids on poplin, swans on voile and fishies on knit. Wow, and I can use them and not hoard because with the disc I CAN PRINT MORE ANY TIME I WANT!!!! Sorry, I just cannot exaggerate my excitement over this fact. I also have to go buy some notecards to make myself some stationery. 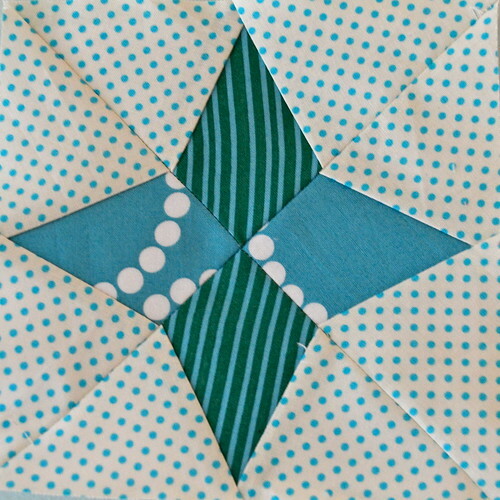 Okay, have to go prepare for teaching Foundation Paper Piecing for the Charlotte Modern Quilt guild tomorrow night. The meeting is at 6pm at the Morrison Regional Library. Hope to see you there!! You just convinced me that I MUST get this book!!! not that I didn't already want it...but now I HAVE TO HAVE IT!!! So much fun! Getting the fish in a knit was a great idea, there are few cute knits out there! PS - shame on you for making me jealous by using the Nursery Versery for that block! It looks GORGEOUS. The block with the mice is so totally adorable!! I love the farmer's wife block!! I started mine the end of last year and am hoping to get more blocks done too...but I haven't....in a long time! Haha, I'll join you though on the summer 2013 goal! p.s. your son is so cute. I've got another two years before mine goes off. it'll be here before I know it. scary how fast they grow. Those little mice are adorable! Best of luck to your little guy and the start of school. It will be a great year for him. I can't believe mine just started 4th grade. Time flies so enjoy every minute. If you can, will you bring that book tonight? I would love to see it. Wow that was a lot to put into one post! The farmers wife block in nursery versery is very cute! I also just got my copy of the HR book. I've yet to order any but I'm also excited that we can make more any time we want! Hurrah!